We’ve talked about the JuiceCan once before. It’s a project looking to get funded on indiegogo, so I reached out to the company and requested they send over a review sample. Knowing this wouldn’t be the final product, I still wanted to get a sense of how this whole concept works. First, let’s take a look at why the JuiceCan is such an intriguing product. 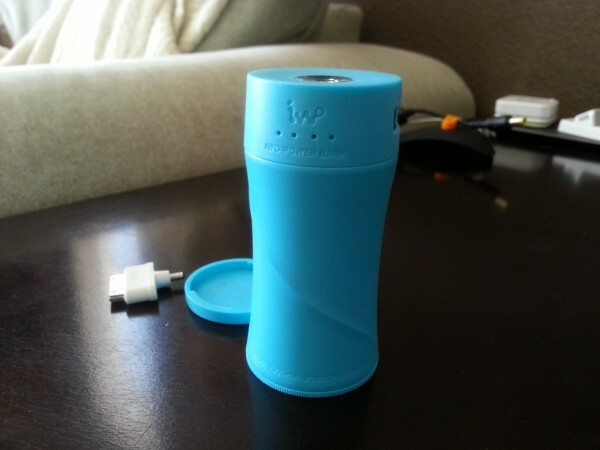 The JuiceCan itself is a standalone 7800 mAh battery pack, shaped (and actually sized) very similar to one of those cute little 8oz soda cans. What makes the JuiceCan unique is its ability to connect to other JuiceCans to create a JuiceCane and supply a whopping 54600 mAh – enough to charge an iPad 14 times over! What I wanted to see was does the JuiceCan actually live up to that promise, and how does the “cane” work? First let’s talk about power. 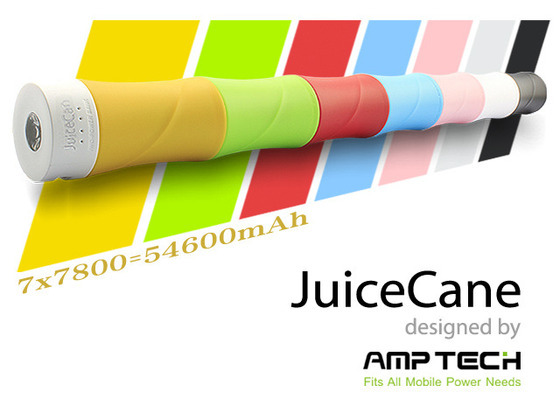 The JuiceCan itself promises 7800 mAh (roughly 3 iPhone 5 recharges). From what I can tell that’s pretty accurate. 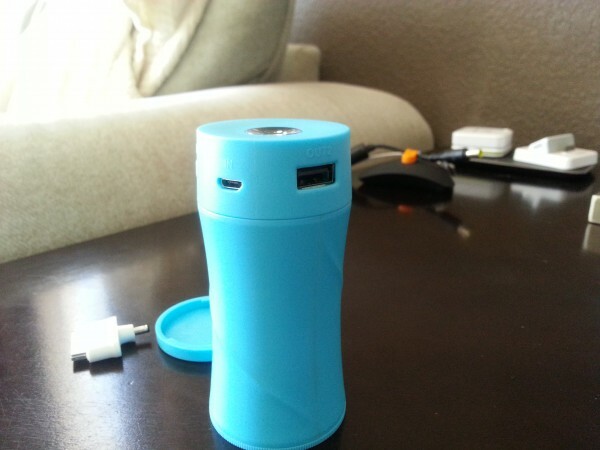 I’ve used the JuiceCan to recharge a couple different devices including the iPad Mini and the Galaxy Note 2. With both devices at a fairly low battery percentage the JuiceCan was able to bring both back to 100% and still have some left in the tank to top off the Nexus 4. What’s that you ask? 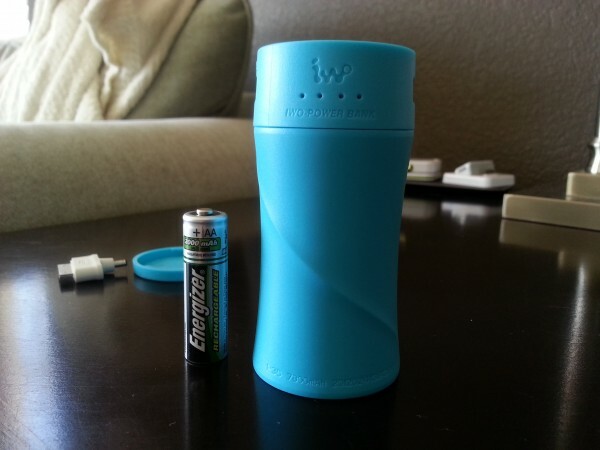 How quickly can it charge? Well, when I did think to time it, the iPad Mini went from 53% at 8:06 PM to 95% by 10 PM – plugged in by itself. Not bad as that shows about a 42% increase over 2 hours. According to the battery widget on my Galaxy Note, the draw prior to plugging it in to the JuiceCan was -2mA and plugged in it was gaining 478mA. For the record an iPhone charger shows at 725mA using the same cable, so the JuiceCan is a little slower to charge, but then again its not plugged into a wall socket. The picture above gives you a little indication of how the JuiceCan becomes a JuiceCane. The system is modular. 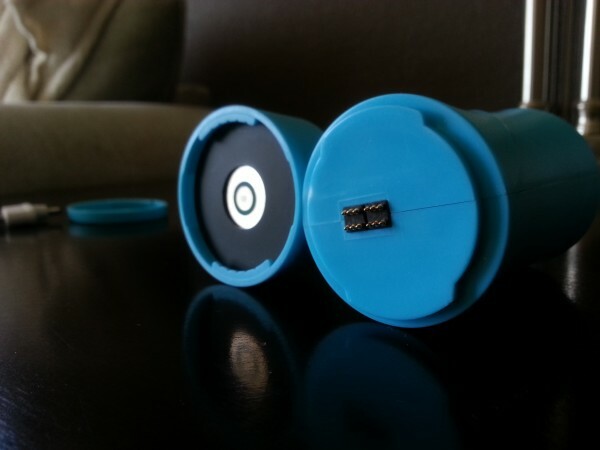 Each “can” has two ends – one with a receiver like you see on the left and one with the pins on the right. Each “can” connects to the other using this solid twist-lock setup so they secure together very well and won’t easily come apart. The top of the JuiceCan is also a little module that twist-locks in to place. When attached you have four LEDs that indicate charge state, two larger USB connections (output), one micro-USB (input), an on/off button and a flashlight on the top. If there’s one downside to the JuiceCan it’s the on/off button as there is no state indicator. I’m never quite sure if the unit is on or off until I plug something in to it. It’s a very minor issue and definitely not a deal breaker. The flashlight is also a very handy addition. If you’re in a situation where the power fails, you’ve not only got a way to keep your devices running, but you’ve got a built in flashlight. It’s an added bonus that you won’t appreciate until you really need it. 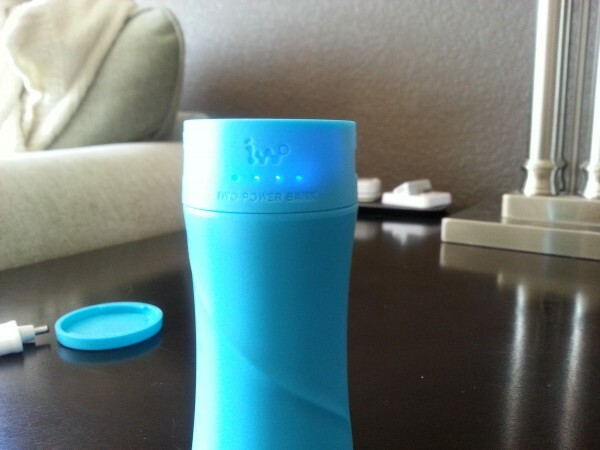 My review unit was well built, everything fit together nicely, it felt solid without being too heavy (weight is similar to the Note 2) and the JuiceCan delivered the power it promises, with the option to add more power should you need it. All in all, the JuiceCan gets a huge thumbs up from me, and I can’t wait to get another one. The JuiceCan isn’t available yet. They still need your help getting this product to market. There’s a few different DONATION options available in order to help fund the campaign, and I’d suggest you review those to find the one that suits you. The JuiceCan was provided for review on iSource. For further information regarding our site’s review policies, please see the “About” page.